Virginia Living Museum: Touchtanks, Creepy-Crawlies & More! Virginia Living Museum - We Love This Touchy-Feely, Indoor-Outdoor "Zoo"
The Virginia Living Museum in Newport News is one of our kids' favorites for "touchy-feely" fun. After a serious upgrade and facelift several years ago, this museum/zoo/planetarium has become one of our frequent stops in the Virginia Beach area. 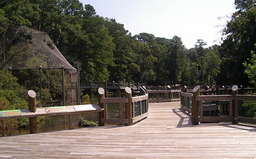 The museum showcases the habitats, wildlife and plant species you'd see during outdoor adventures in Virginia. Want to see what bees do with pollen when they enter the beehive? It's here. Want to traipse through a mini replica of an underground mine? This is the spot. Want to see how flounder change their colors to blend in with their surroundings? Look no further. The Beehive - bees laden with pollen fly into the museum through a little hole, then walk through a glass tube into a huge, glassed-in hive. Watch them as they wiggle and giggle up the hive to process the pollen into honey. We've never seen the queen (but we know she's in there). Maybe YOU will! The Giant Turtle Shell and Log - Real or replica? Who knows? But kids LOVE climbing through this and a huge log. Great for photo ops. 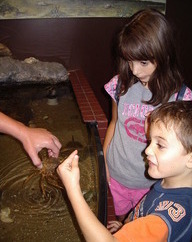 The Touch Tanks and Sensory Centers - This museum caters to touch, touch, touch. Touch a horseshoe crab and watch it wave its spiny tail. Touch a crab and check out its hard shell and grasping pincers. Go to the sensory centers and feel snake skin...learn to recognize animal tracks...look through a microscope at the complexity of a fly's transparent wing. Personally, I always like to see the snakes (don't know why, but I find them fascinating...not that I'd ever have one for a pet). The museum has a selection of the slithery fiends you'd find in Virginia...in fact, all the animals at the museum are ones you'd find in the state ("Virginia Living Museum...get it?). 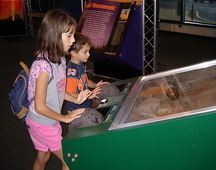 The Virginia Living Museum also has great visiting exhibits (our kids loved their "Scoop on Poop" visiting exhibit, especially the game where you make dung beetles race each other as they push their spherical dung balls up the hill). Most traveling exhibit requires no extra fee. When you've had enough of the inside stuff, there's an outside boardwalk/nature trail, featuring an aviary, foxes, eagles, skunks, etc...perfect for a stroll on a nice day. There's also a planetarium, but since we've never visited it (there's always been so much else to do!) -- we can't comment on it. The Virginia Living Museum is open daily 9 am to 5 pm, Labor Day to Memorial Day. (From Memorial Day to Labor Day the hours are the same, except that Sunday hours change to Noon to 5 pm. It's closed Thanksgiving, Christmas Eve, Christmas Day, and New Year's Day. Admission to the Virginia Living Museum is $20 for adults and $15 ages 3-12. Add $4 each for admission to their planetarium. Members are free, and since the museum participates in the ASTC Science Museum Program, membership gets you into other participating museums for FREE (Click here to find out how you can visit museums for "free"). Try as I may, I couldn't seem to find an ongoing military discount. But, here's a link to many local attractions, resorts and hotels which DO offer military discounts, including Busch Gardens Williamsburg and Great Wolf Lodge. If zoos are your bag, consider visiting the Virginia Aquarium or the Virginia Zoo. Both offer hands-on fun and lots of unusual creatures. Virginia Aquarium (located near the Virginia Beach downtown area) has over 300 hands-on exhibits and 700,000 gallons of tanks featuring sharks, huge sea turtles, and exotic fish and creatures, such as a rare albino alligator. 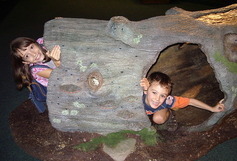 My kids love Virginia Zoo because of its natural habitats and its petting zoo. One of our favorite outings is to go there in the morning, then hop on over to nearby Rowenas Tea Room for their special Children's Tea. For reviews of other local attractions, including Busch Gardens Williamsburg, Great Wolf Lodge, Nauticus, and Water Country USA, click here.